HOUSTON - As more than 1,500 people, including first lady Melania Trump, fill St. Martin's Episcopal Church in Houston on Saturday morning for the funeral of Barbara Bush, the Rev. Russell Levenson Jr. said that while others will extol the former first lady's role on the world stage, he will speak of what he personally witnessed -- her faith. You can watch LIVE coverage of Mrs. Bush's funeral Saturday at Noon on Channel 2 and WSBTV.com. "My role is to lift up her faith, which was strong, which was abiding, which was real," Levenson, the pastor of St. Martin's, told ABC News. "While I was her confidant, it's hard to be a confidant to a woman who had no secrets. There were none," he said. "What you saw is what you got. We had very open conversations about her faith and about her love of God and her love of others, which I think was evident in all that she did." Levenson said he was at Mrs. Bush's beside in her Houston home with her husband, former President George H.W. 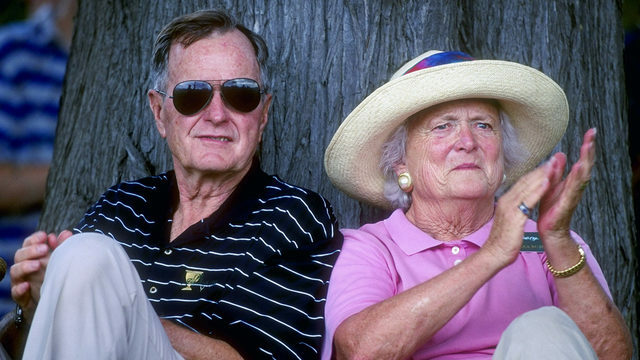 Bush, and other family members on Tuesday when she died around 6 p.m. at the age of 92. President Donald Trump -- who called Mrs. Bush "an advocate for the American family" -- ordered flags at the White House and at all federal government buildings lowered to half-staff Wednesday as the nation mourned the death of Mrs. Bush, who served as the first lady of the United States from 1989 to 1993.